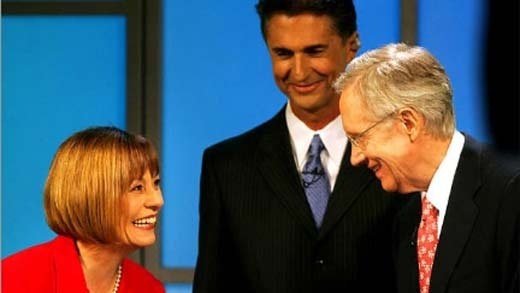 Senator Harry Reid and Sharron Angle met at the Vegas PBS Studios Oct.14th for their one and only Senate debate to convince voters that a vote for them would be a vote in the right direction to take our already weakened country. Both candidates had strong followings at Thursday's debate touching on topics and issues that linger in the minds of voters this primary season. Senator Harry Reid (D) and Sharron Angel (TPA) look to sit on the senate and fight for the concerns of our American citizens. Though Harry Reid has held a Senate seat for the state of Nevada for many years, his elongated run has been put in jeopardy due to a wounded economy and his state holding the highest unemployment rate in the Union. As strategies were put on the table and verbal political jabs were thrown, voters watched eagerly awaiting to see if either candidate touched on issues that concerned them and others around them. While Angle touched on the job issues that plague Nevada and the illegal immigration issues, Harry Reid stuck to his guns defending the new health care law. "We had to do health insurance reform to maintain competitiveness in the world economy and create jobs," he said. Sharron Angle seem to fall short of pushing the accusation that Harry Reid is responsible for the turmoil that his state (Nevada) faces with the huge unemployment rate while Harry Reid fell short of touching bases with his most important constituencies: Senior Citizens, the Latin community, and veterans. For more on this story please click the link.